This article was first written in 2009 by Mike Traken, who was the Tutor/Mentor Connection (T/MC) map maker from 2008-2011. I've updated it for 2016. Mike wrote, "I decided to focus on clearing up any possible confusion as to what we do at the T/MC. Because the work that the T/MC does is really complicated, multi-faceted, and potentially confusing at first. What exactly does the T/MC want to accomplish? You can read about it... you can listen to us talk all day long... but maps give a visual to grab onto, and it's effective." But more! T/MC is looking to share ideas, goals, and strategies among all programs... an exchange of ideas - to ensure that existing programs maximize their growth/potential with their particular group of kids. Many documents geared toward this sharing these ideas exist in the T/MC's forums and in their web library - through the Tutor/Mentor Institute. Additionally, T/MC occasionally organizes a semi-annual conference to bring as many people together as possible to exchange ideas and information in person. But more still! 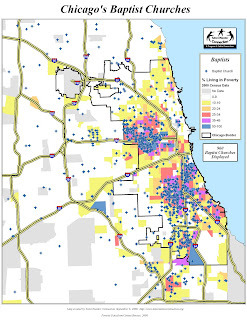 T/MC analyzes the program location data to determine where programs do NOT exist - where, among the most impoverished, high-need areas... where kids are lost in school and running the streets - do we need leadership in creating NEW T/M programs? What resources out there can host and/or finance these new programs... and what resources are available for getting the word out to people who do not even know these programs exist? This is where maps are extremely helpful. This is what I do." These churches and their congregations may not have the financial support needed to support the existing programs. But they would make great locations for NEW programs in neighborhoods where the school system is failing the children, and where these students desperately need additional tutoring and mentoring. And the church leaders here can broadcast the message to unknowing parents in the congregation, and make them aware that T/M services exist for their children's benefit. Of course, there are Lutheran congregations in high-poverty areas too - and these can serve many of the same functions as the Baptists. But, those in more affluent areas might want to help in other ways too. Perhaps members in the wealthier suburbs who commute, using highways that slice through the high-poverty areas, can take some time each week to volunteer as a mentor. Perhaps their places of employment have philanthropic money budgeted and would like to help contribute financially. Of course, we here at T/MC have mapped the locations of many other Christian denominations, as well as the locations of Jewish, and Non-Judeo-Christian faiths. Mike simply chose these two as examples. 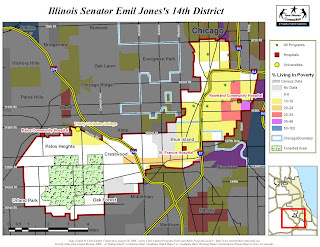 Next, is a map which illustrates how political leaders can organize resources in their districts, using the Illinois 14th Senate District map. This map shows the location of universities and hospitals which might have faculty/employees/students/leaders who want to work in a hosting, donating, or informational capacity... to support the kids who reside in the 14th district. Of course, we're not intending to single out the 14th district. This is just one district chosen to exemplify how the TM/C maps can help leaders in a given community organize their efforts to support tutoring and mentoring. Sounds great, doesn't it? Who would oppose helping kids, families, and communities in need? Mike wrote, "When I first got here, I assumed maybe the business community would be a little removed and cold toward programs that do not immediately affect their bottom line. I was wrong. Companies like CVS have a strong philanthropic presence in the community:"
Law firms, businesses, other professionals - many see that investing in the area's impoverished communities can help build new markets, replenish struggling markets, and groom new employees, for the benefit of the local economy and in the fight against crime. These organizations are invaluable sources of desperately-needed revenue, volunteers, and information-sharing for T/M programs everywhere. TM/C wants to create new partnerships and inspire more participation among professionals/businessmen everywhere. 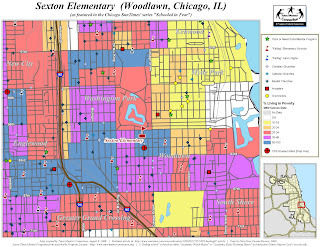 Browse articles written from 2008 through mid 2011 that show more examples of maps and how they can be used. 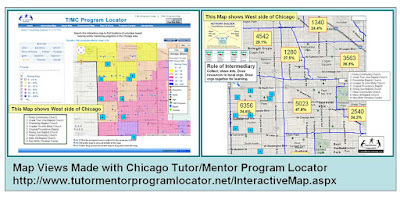 Unfortunately, due to the financial crisis that started in late 2007 and still has a negative impact, the Tutor/Mentor Connection was not able to continue to fund the map making position after 2010 and new maps like these have not been created since then. In addition, the on-line program locator, created in 2008, which has been used to make maps like the ones shown below, has also not had funding since 2009, thus it's not been updated and some features no longer work.. 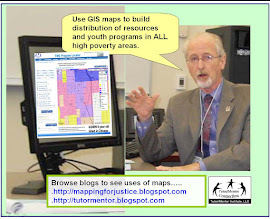 Since 2011 this blog has shared map stories created using the Program Locator, and has pointed to new map platforms hosted by others, which can also be used to make map stories. It would be a great project for a company, and company team, to adopt the Tutor/Mentor Connection and become a partner with the Tutor/Mentor Institute, LLC, so these resources can be updated, and made available in cities across the world. If interested, let's connect. Find me on Twitter @tutormentorteam or Linkedin or Facebook. Pent up anger has now been unleashed in Milwaukee, following a police shooting. This follows Ferguson, MO, and Baltimore. What city will be next? 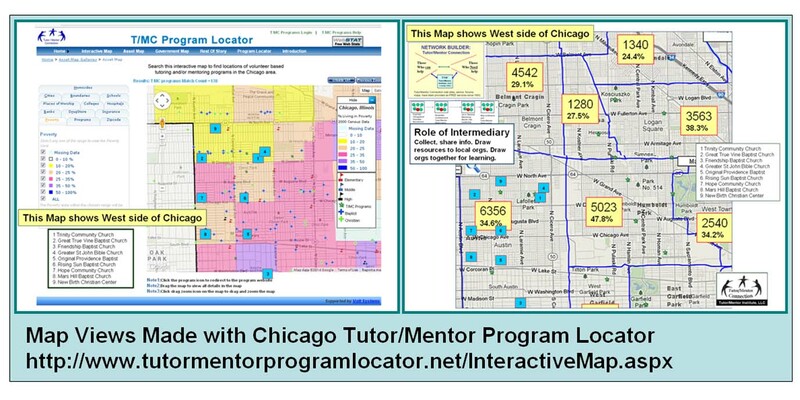 I started the Tutor/Mentor Connection (T/MC) in Chicago in 1993 with a goal of helping volunteer-based tutoring and/or mentoring programs grow in high poverty neighborhoods. 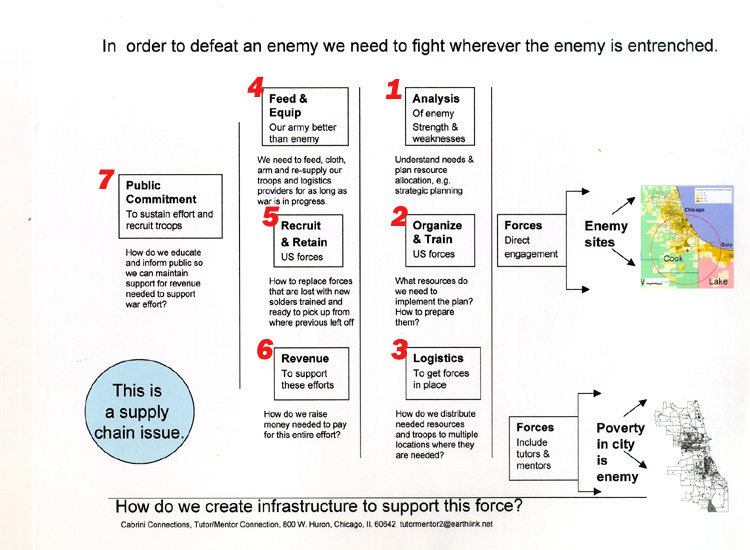 I used a quarterly newsletter to share this vision and to share information from my web library. 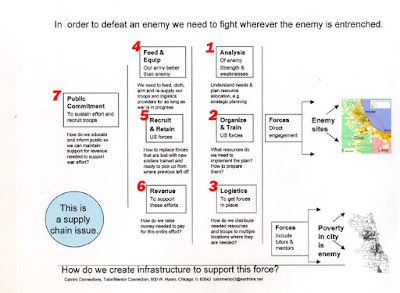 In the mid 1990s I was invited by the Milwaukee Foundation to add about a dozen organizations from Milwaukee to the distribution list, which I did. In the following years I met with leaders from Milwaukee, and people representing Milwaukee programs came to Chicago for the spring and fall Tutor/Mentor Leadership and Networking Conferences. 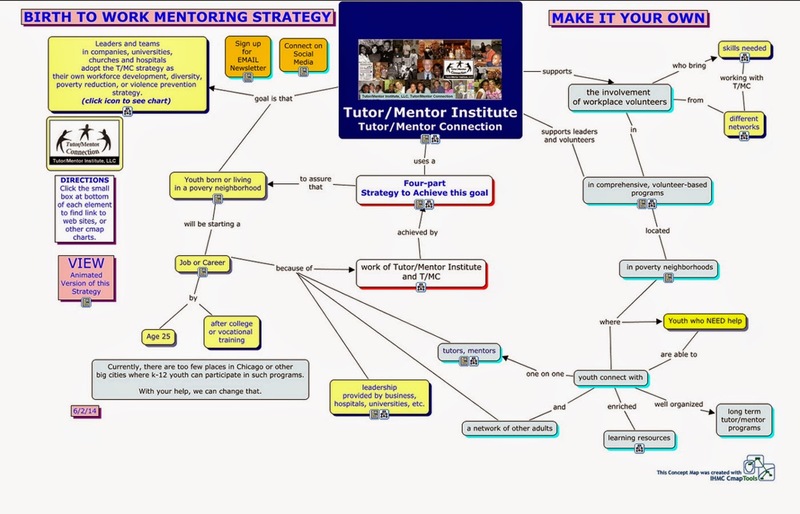 However, this never led to adoption of the Tutor/Mentor Connection strategy in Milwaukee. It's never been adopted in Chicago, either. Below is a map that shows the racial concentrations in Milwaukee. I've pointed to this mapping platform below, showing racial distribution in Chicago. 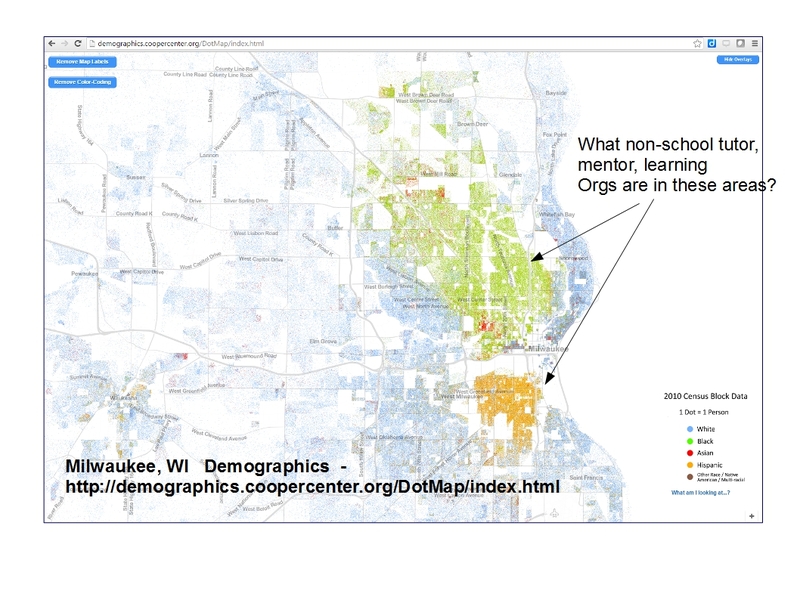 If someone in Milwaukee were leading a T/MC strategy they would be able to produce a map like this, with overlays showing locations of non-school tutoring, mentoring and learning programs. Using that map the would be leading a year-round marketing campaign intended to draw volunteers and donors to existing programs, while helping groups create new programs where more are needed. 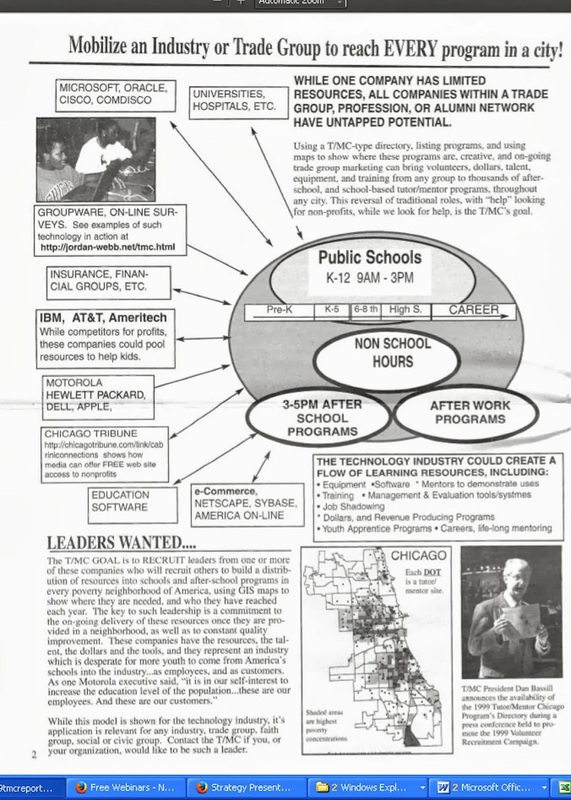 They would have people meeting regularly to share ideas and they would have people connecting with programs in Chicago and other cities to borrow ideas from more places. 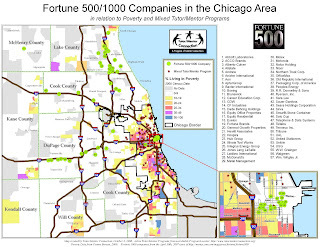 The first map below was created using the Chicago Tutor/Mentor Program Locator, which the T/MC built in 2008, but which has not been funded since 2010. It's a model that should be duplicated. It is also a starting point for people who want to partner in stead of starting from scratch. This second map is from a Brookings.edu article, showing cities around the country with the same problems as Milwaukee, Chicago, Baltimore, etc. I wrote about it here. Leaders in everyone of these cities should be reading this article that I shared on the I-Open Blog, which focuses on the Cleveland, OH area. If you cannot answer "YES, We do." you should be creating a team to begin digging into the ideas I have been sharing for the past 20 years, and you should be inviting me to meet with you to help you understand and apply those ideas. It's not a quick fix. But you don't want to look back in a few years an say "I wish we had done that." 8-21-16 UPDATE: Here's a New York Times article titled "Affluent and Black, and Still Trapped by Segregation". In addition, here is a concept map showing the research section of the Tutor/Mentor web library, which included many articles related to place, race and poverty. Until many more people are reading these articles, and combining their learning with direct interaction across race and poverty boundaries, too few will have enough information or commitment to actually find solutions. 12-27-16 UPDATE: Here's another article that uses maps to focus on violence in Milwaukee. Here's article I wrote showing need for groups of people --a village-- to form in different neighborhoods to try to solve these problems. 8-4-17 UPDATE: Here's article titled "Structural Causes of Racism and Economic Segregation in SE Wisconsin. 11-10-17 Update: Here's an article showing "The 5 Worst Cities for Black Americans". Milwaukee and Racine, Wisconsin are on the list. The graphic below shows the largest cities in the world. You can find it on this page, which features an interactive map showing growth of mega cities over the past 100 years. 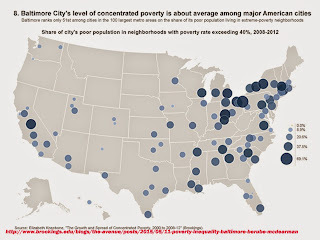 I have written articles in the past, such as this one, stating that cities with populations of over 1 million, especially those with populations over 10 million, have unique challenges and opportunities due to the size of the city, the bureaucracy, and the isolation of people living in areas of concentrated poverty. Leadership Commitment. Mentoring Kids To Careers. See map. Four part strategy. Actions needed to achieve commitment. See here. See description here. Planning Process. Including building "public will". See explanation. 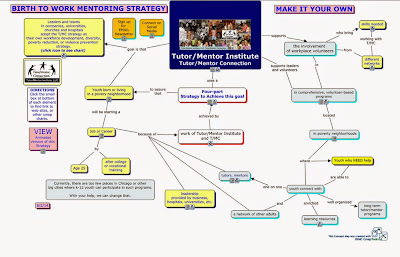 Throughout this blog, the Tutor/Mentor blog and the Tutor/Mentor Exchange blog, I constantly demonstrate a use of maps to focus attention on were people need the most help, and to support efforts that draw needed resources to each of these areas. 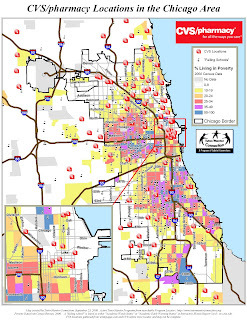 If you live in one of the cities shown on the map above, and you're concerned about the impact of poverty, inequality, youth isolation, etc., I hope you'll take a look at these maps, and browse my Tutor/Mentor Institute, LLC web site and share this with others who have the same concern, and who may already be doing great work to reduce these problems. People in big cities need to be connecting, building relationships, sharing ideas, and innovating ways to draw resources to their work. I'm on Twitter @tutormentorteam and Facebook, too. Also on G+ Let's Connect. NOTE:10-19-17 update. 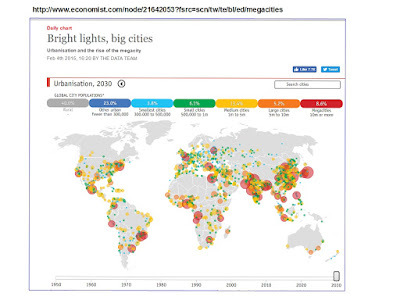 This interactive map shows world city population growth since 1950 and projected out to 2030. I encourage you to look at the map on this Brookings.edu article, titled "Political rhetoric exaggerates economic divisions between rural and urban America". The map, and the article, show that "Nearly 54 percent of people living in areas classified by the Census Bureau as rural also live in a county that is part of one of the nation’s 383 metropolitan areas." Thus, it's the other 46% who are not closely connected to any city. This is significant because the web library I've been building since 1993 focuses on urban issues and urban poverty and inequality. In many articles I've suggested that the largest urban areas, where school age student population is greater than 100,000 students, have unique problems caused by the number of students and the size of the bureaucracy that are different that rural areas, where lack of density and distance between students and potential support offer barrier to place based support services like non-school tutor/mentor programs. Thus, I've encouraged others to duplicate the Tutor/Mentor Connection, using all the same ideas and practices, but with a library that identifies uniquely rural challenges, as well as organizations that are innovating solutions to those challenges. If you're building such a library, let's connect.